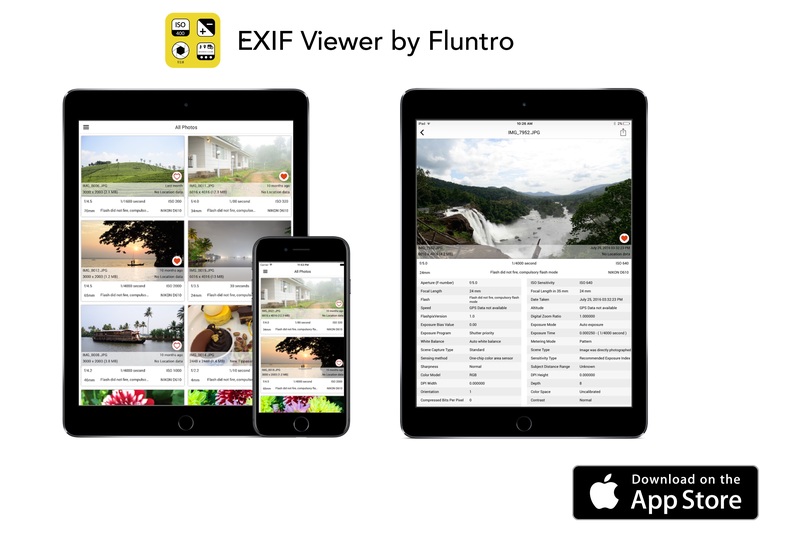 [prMac.com] Thrissur, India - Fluntro today is very pleased to announce that Exif Viewer, the company's popular photography app, is now ranking in top charts on iOS App Store across China, Italy, Taiwan, Hong Kong and is now FREE for a limited time (No in app purchase needed). Exif Viewer is a beautiful and a well crafted iOS app for photographers and photo enthusiasts alike. The app displays EXIF metadata of any photo on any iOS device(s), Photo Stream or iCloud, including metadata tags for ISO, shutter speed, focal length, camera model, lens model, lens serial number, time stamp, aperture, shutter count and many more. Discover a bit more about your photos and technical details using Exif Viewer App. Anyone can take a photo with their digital camera or iPhone and review its EXIF Metadata to help improve the next shot. It also offers one of the best ways to learn from others photography techniques. Users have the ability to customize the User Interface, re-order EXIF tags in the way they prefer, with the ability to hide EXIF tags that they don't want to see, as well as select preferred date formats (eg 1 day ago vs December 30th 2016 vs 30-12-2016 etc ). The app also supports three different types of Views, List view, Grid view and Map view mode. In List mode, you can swipe exif card to quickly overview EXIF Metadata. In Grid view, you can view bunch of images on same screen and quickly find image you are looking for. In Map view mode, you can quickly locate a photo and tap on it to view exif detail. Tap on location name to toggle between GPS coordinates and location name. As a privacy concern, users may, or may not, want to share EXIF details containing location. With Exif Viewer, users can remove EXIF Metadata including the images GPS location (known as Geotagging of photos) and share an image with, or without, EXIF metadata. You can also copy EXIF data to Clipboard, so that you can paste & share EXIF data as text on any other App. Exif Viewer also supports 3D Touch on iPhone 6S and iPhone 6S Plus (or newer device with 3D Touch support). The app includes shortcuts to access Favorites, Photo Streams, Albums, and All Photos quickly. Also Peek and POP functionality on ExifCards and photos in Grid view. Exif Viewer also contains its Photos Extension and iMessage App Extension along with the fully functional app. So once you download Exif Viewer from the App Store, you get the extra functionality of embedded photos app extension with iMessage. Using Exif Viewer photos extension you can view EXIF Metadata of photo directly from Photos App. Send Exif Cards on iMessage App to your friend(s) with an option to turn off EXIF Metadata as text. * "5 stars for being the first and best integrated solution for photographers who care about their photo metadata." * "First class app ,enables instant exif information plus enlarged picture ,highly recommended"
* "Stable, fast interface. Very good integration with all photo app. Big customization abilities. Last but not least - nice viewer." Exif Viewer by Fluntro is available in English, Danish, Dutch, French, German, Italian, Japanese, Portuguese, Russian, Simplified Chinese, Spanish, Traditional Chinese. For a limited time, Exif Viewer 2.8 is Free (reg. $2.99 USD) and available worldwide exclusively through the App Store in the Photo & Video category. This discount could vanish at any time so be sure to check it out as soon as you can. Located in Thrissur, India, Fluntro creates iOS Apps that our customers love to use. All Material and Software (C) Copyright 2017 Fluntro. All Rights Reserved. Apple, the Apple logo, iPhone, iPod and iPad are registered trademarks of Apple Inc. in the U.S. and/or other countries. Other trademarks and registered trademarks may be the property of their respective owners.